A leisure day before a long week up in mountains. Spent early part of morning packing, organizing gear/food, and watching the NFL Red Zone tv show. First American football I’ve been to see for any length of time. Packing out today with heaviest load yet, carrying seven days food. Had to use extra stuff bag to fit it all and can’t close the top of my pack. Hope the rain holds off until after I eat some of it. Before leaving, I had a “world famous” bacon butty at the Havelock bakery/cafe, then headed down the road. Was a flat, road hike, mostly on a logging track, so it was pretty dusty and I had to get out of the way of the big logging trucks. Arrived at Pelorus River in time for lunch at the cafe. It’s a DoC campground but first-rate with high tech showers, laundry, kitchen, and of course the cafe. The only drawback is that it isn’t licensed, so no beer, sigh. Set my tent up by the river, the same one I’ve been following all day today and will most of the day tomorrow. I had a quiet afternoon reading and writing on the deck by the camp kitchen, only drawbacks are all the sand fleas which really do draw a lot of blood, so I had to dig out the full strength DEET. Went back to the cafe for sorbet and tea– I’m so cultured– and then had to figure out how to heat a meat pie without an oven. I put some water in my Jetboil, put it on the stove burner and plunked the pie on top. The bottom of the pie got hot and soggy, the top stayed crisp and cold. Still, it was good. A young Swedish came by with their two children were cooking there too–he is an avid fly fisherman trying to interest his five year old son in the sport. Unfortunately there were no trout in this stretch of the river today, and the son was more interested in his soccer ball. That reminded me of my sons, who could entertain themselves for hours wi a soccer ball. Actually they still can, though the projectile of choice these days is more likely a frisbee. 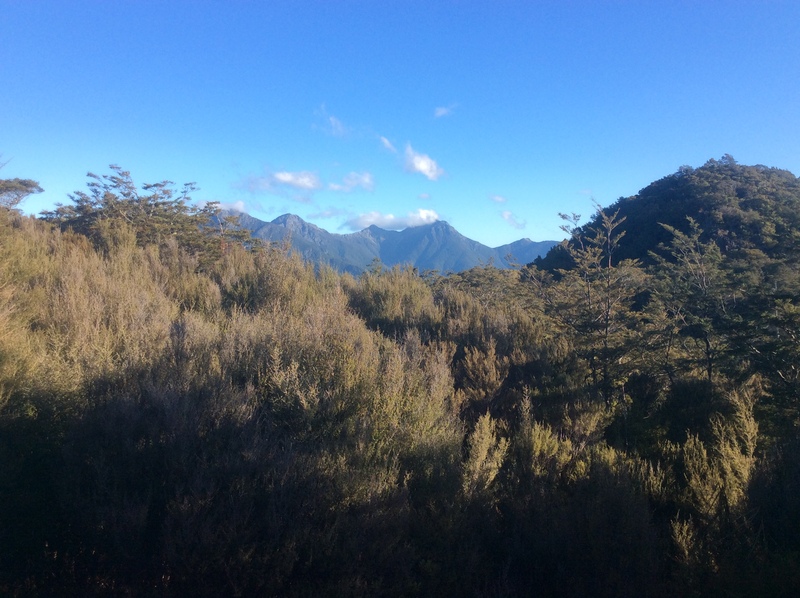 Two observations about the South Island– so far, no rain (four days of sun in a row is definitely a record) and a lot more bugs, particularly flies. Made me realize that it is not that there are a lot of them here, but that there were so few on the North Island. I’m not sure why, but I’m guessing colder weather and higher winds. It’s been much warmer this last week, as if Spring is finally here.